As the saying goes, when it comes to creating a successful business everything starts with a sale. Generate sales and things have a tendency to fall into place. Struggle to get sales, and your business flounders. But, in order to get sales you first need to generate interest. 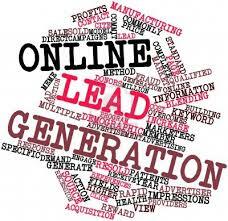 That is, you need to generate leads – and the best, most effective way is to get these leads online. Because the price point is higher with services, the sales cycle is naturally longer, and a lull in your lead flow results in a sales drought – often the dagger for young, cash strapped businesses trying to get off the ground. Without a steady stream of qualified leads business growth will be unpredictable, at best. Achieving lead flow is not easy, especially if you are building your prospect list from scratch, but it can be done. Like every other aspect of business, if you want success you need a plan, and you need to execute this plan on a regular and consistent basis. 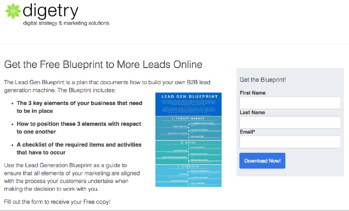 This blog post is that plan – it is the ultimate guide to lead conversion: a 27-point, best practice outline to generating and converting new leads online. What is the definition of lead conversion? This post is a best practice evaluation of the online assets that impact Visitor-to-Lead Conversion. Why is lead conversion important? Your ability to convert website visitors’ to leads, also known as lead generation, directly impacts your sales and ultimately your bottom line. The best practice metrics described in this post measure the effectiveness of your online assets toward lead generation, lead quantity, and lead quality, identifying deficiencies and overlooked opportunities to optimize your marketing and convert more website visitors to leads. What's a good lead conversion rate? As discussed above, a conversion rate for our purposes is calculated as the percentage of website visitors who fill out a form on your website to become a lead. rounded off, while bar length represents the exact answer. Seeing these numbers, it’s hard not to compare and judge your campaign’s performance, but make sure you’re considering all of the factors that go into that conversion rate. 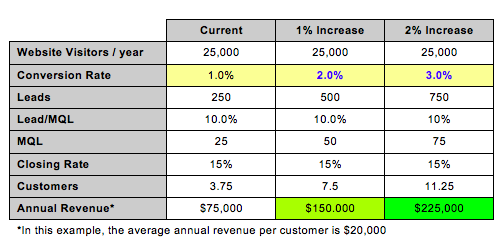 Conversion rate averages can vary across industries, products, marketing channel, etc., and as MarketingSherpa points out, there are many possibilities for the variability of conversion rate performance among the different industries, from customer motivation, to promotional budgets and marketing channels, as well as the definition of the conversion rate used. For example, a conversion for the Financial Services industry may be an email address while for Retail it’s everything from name and address to buying preferences. In addition, you need to account for the performance of the marketing asset itself. If you’re getting lots of clicks but no conversions you probably need to make some changes to the landing page. For example, does the landing page provide the information the visitor is expecting based on the ad copy and the keyword they searched? Is there a strong offer that they’d be willing to submit their contact info for? Another factor to consider is the conversion rate at each stage of the sales process, or customer journey. Someone who is in the consideration phase will convert at a different rate than someone who has narrowed their decision to two competing offerings. Traditionally, it’s much harder to convert top-of-funnel visitors compared to those farther along in the sales funnel. But, once you get that crucial contact info and you’re able to qualify them, you’re working with someone who wants to hear from you and learn more about your product – moving a known prospect over to the sales team becomes a lot easier than convincing an unknown visitor to fill out a form. So, while conventional wisdom may say that a good conversion rate is somewhere around 2% to 5%, you really need to judge the performance of your campaigns based on your own success metrics and goals, not industry averages and benchmarks. 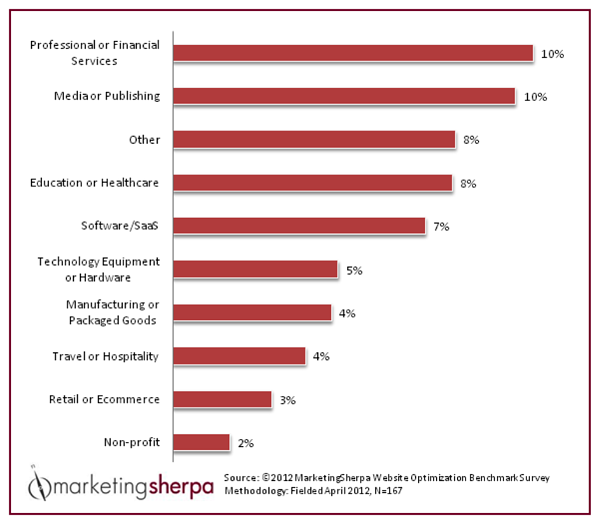 Data like that provided by MakretingSherpa can help you get an idea of what the landscape is like for similar campaigns, not as a right or wrong answer for how your campaign is performing. Collecting the information needed to qualify a lead is more important than trying to attain an unreachable conversion rate of a completely different industry. The most common mistake I see among business trying to convert leads is a lack of focus. It’s easy to understand why businesses take a broad approach to their lead generation: they feel it’s necessary to cast a wide net in order to catch the most fish, and that by focusing your efforts you will be losing out on opportunities. But, by not having a focused approach to your lead generation you are already losing business – your customers don’t see what they are looking for because your offer is too generic, and as a result they move on. By concentrating on these three core elements of your business you can better reach your target audience, appeal to their specific needs, attract them as visitors, and eventually convert them to leads. 1. Target Market: Focusing on your Target Market allows you to understand who your customer is – what they are looking for, what keeps them up at night, the questions they are looking to have answered, and how your business addresses this. 2. 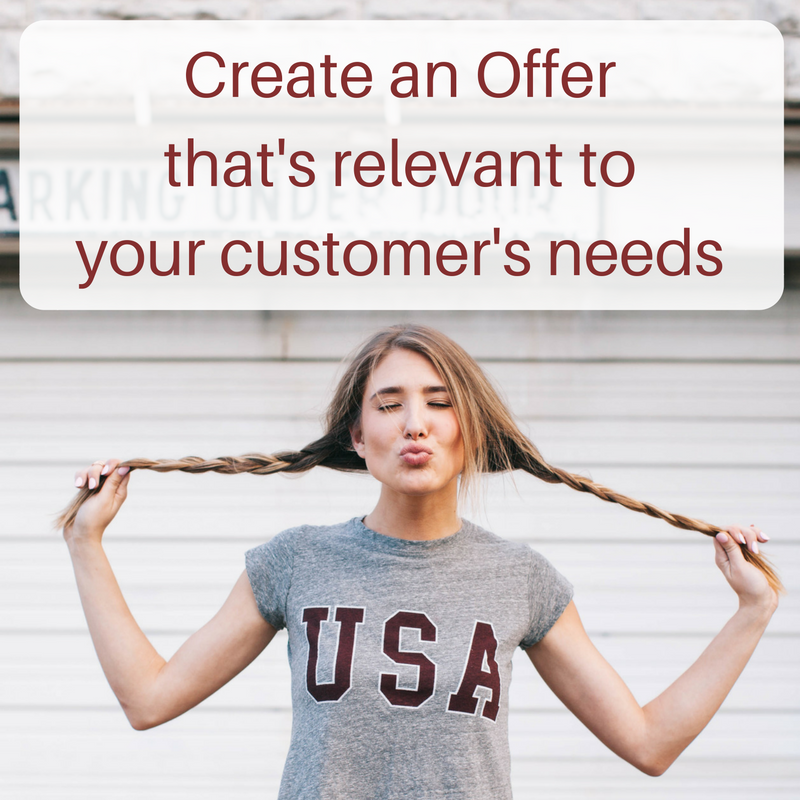 Offer: Focusing on your Offer allows you to communicate with your customers in a way they understand so they clearly see the unique value you provide. 3. 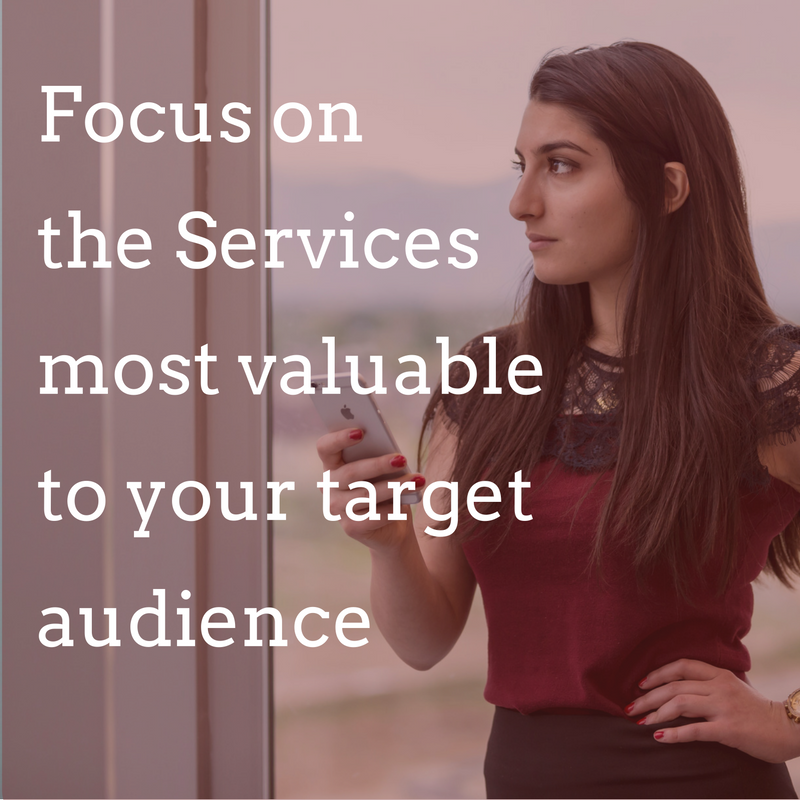 Services: Focusing on your Services allows you to answer your customers’ question and provide what it is they are looking for. When your prospects are clear about the value you can provide, a level of trust has been established, and they are in a much better position to consider and evaluate your services. Having laser-like focus on these three areas means that both you and your prospects are always crystal clear about what makes your business valuable, unique, and worth the fees you charge. What are lead conversion best practices? In order to generate leads you have to generate interest, build trust, and close with a compelling offer. In the section above we identified the three core elements of your business that you need to focus on in order to accomplish this. In this section we are going to look at each of these elements in more detail, as well as the associated marketing activities that must occur in order to create a successful lead generation machine. The first step is identifying your customers and their needs. Not just who they are, but what they are looking for, what questions they have, and what keeps them up at night. Without a deep level of insight your aim will be off, if only slightly, and that’s enough for your marketing messaging to miss its target. To understand your customer, perform these five lead conversion analysis activities. 1. Customer Identification – Identify which of your clients most often lead to successful engagements and make these types of clients the focus of your marketing efforts. 2. SWOT Analysis – Identifying your company’s strengths, weaknesses, opportunities and threats will allow you you to focus and execute on what you do best. This will attract more interest. 3. Primary Research – The best way to understand your target market is to ask your customers and prospects what they think of your services and what they are looking for so that you can more accurately address their needs. 4. Market Research – Survey your marketplace by using information from your own marketing and publicly available reports and studies. This will confirm your direction. 5. Data Analysis – Take all the data from your Primary and Secondary Research and analyze it for trends and themes that provide insight into your customer and target market. 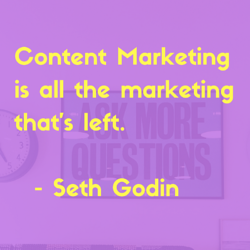 Use this insight to inform your marketing activity. Only after you thoroughly understand your customer can you position your messaging in a way that will reach and resonate with them. The second step in creating a successful lead generation machine is to connect intuitively with your customers by crafting and sending a message they understand, believe and is relevant to their needs. 1. Offer Alignment – Answer the questions your customers and prospects are asking in order to identify the solution that your customers are looking for. Then decide that this will be your primary offer moving forward. 2. Segmentation – There are going to be at least two or three distinct customer types who, while all buying your service, buy for different reasons. Define these different customer types so that you can better segment your leads. 3. Persona Creation – A persona allows you to identify who you want to reach and where your best customers spend time online. Working with the different customer types you defined above, create personas for each of them. 4. Customer Decision Journey – Map the path your personas take when deciding to buy your service. Their customer journey allows you to understand the steps they take as they consider, evaluate, buy and interact with your service. 5. Messaging Matrix – Write the messaging themes that resonate with your buyer personas at each stage of the Customer Decision Journey - script the language that speaks to the needs of your persona at each stage. You probably offer many different services, but in order to attract and generate the best, qualified leads for your business it’s important that you emphasize and promote the right services. 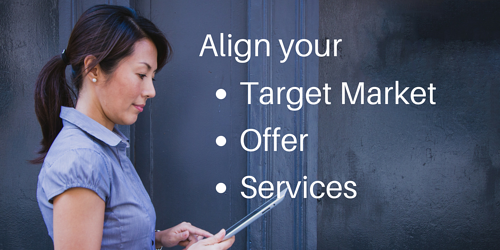 Focus on the services that are most valuable to your target audience, and which directly support your Offer. Then align your services with your customer’s online behavior and the marketing channels they use to get their information. 1. Services Alignment – Identify the services for which you provide the most specialized, high value outcomes for your customers and your business. 2. Heat Map – Create a prioritized list of the marketing channels you need to focus on by mapping all the available marketing channels and their relationship to your customer touch points. 3. Keyword Creation – Identify the words and phrases your audience uses to look for and find your service online. 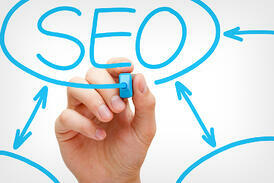 Then ensure that your marketing messaging is seeded with these keywords and optimized to rank by the search engines. 4. Campaign Design – Use the information from your Target Market and Offer work to design a lead conversion campaign that features the channel, messaging, and offer best suited for your ideal customer. 5. Pilot Campaign - Create and run an initial campaign; measure its effectiveness so that you understand what works, and more importantly, what doesn’t work, in order to optimize your successive campaigns. What is a good lead conversion strategy? 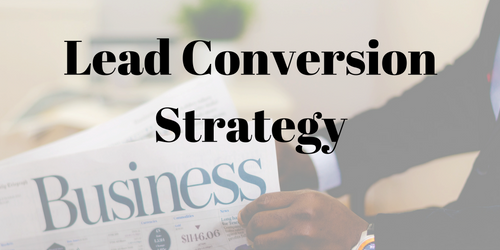 A good lead conversion strategy is to look at your online marketing assets and evaluate, rank, or score their effectiveness for lead generation against best practices. Let's look at each of these assets in more detail. The Home Page is your company's virtual front door. While visitors come from many sources and land at many different pages besides the Home Page (e.g., blog post, product page, etc.) the Home Page is generally responsible for drawing a majority of your website's traffic, either as the first impression or as repeat visitors (who have a higher likelihood of directly ‘dialing’ your website). As such, within a few seconds of landing on the Home Page, it needs to satisfy the visitors’ curiosity and compel them to dig deeper into your website, moving them further down the lead conversion funnel. Evaluate whether your home page is employs best practicesl, whether it's poor, average, or excellent. Here's a great resource to assist your evaluation: Homepage UX Design Tips. The sole purpose of the Landing Page is to convert website visitors into leads by promoting an offer (and receiving their personal information in exchange). The more landing pages you have the more leads you generate: increasing landing pages from 10-15 results in a 55% increase in leads (Source: HubSpot). Keywords are what your prospects use to find what they are looking for online: if your web pages are not optimized they will not rank. There are 5 crucial search engine optimization (SEO) elements on each web page: Page Title, URL, Page Header, Internal Links, and Page Content. All of these elements need to be optimized with keywords; ideally, the same keyword, which is the keyword the page is trying to rank for. Social Media is effective in attracting visitors to your site, converting them to leads, and closing qualified leads to sales. Twitter, Facebook, and LinkedIn are particularly effective for B2B companies, and these platforms need to be optimized for lead conversion. 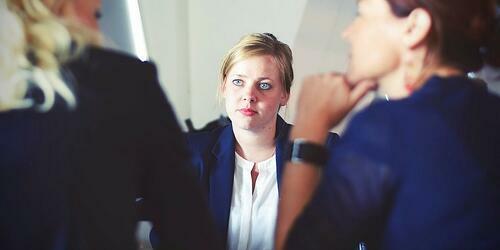 70% of buyers make the purchase decision before speaking with someone in an organization. In order to be a part of this decision process you need to proactively provide content that answers the questions they are asking, track and measure visitor activity, and optimize your content for the platforms they are using to access your content. Mobile friendly, marketing automation & tracking tools, blogging and content marketing. What are good lead conversion tactics? Within each of the five areas identified above (Home Page, Landing Pages, SEO, Social Media, and Content & Site Infrastructure), let’s take a detailed look about how to actually optimize them. Below is the list of 27 elements of your online marketing that you need to optimize in order to convert more leads online! 1. Within a matter of seconds, the visitor should be able to decipher the site’s brand and easily answer the question, Who are you? 2. Similarly, within the first several seconds, the visitor should be able to decipher the company’s product or service offering. Make sure your homepage clearly defines what your business does. 3. It’s not only important to describe what you do but why what you do actually matters. Within a matter of seconds, it should be clear to the visitor the value you provide, the benefits of buying from you, your value proposition. 4. Finally, make it crystal clear what you want the visitor to do next. Instruct the visitor by including a primary call-to-action (CTA) above the fold that instructs the visitor what he or she should do next, something that explicitly directs, visually or otherwise, the visitor to take a specific action towards becoming a lead. 5. Assure the visitor they are at the right place by prominently using the message and imagery from the call-to-action linked to the landing page. Maintaining a consistent message and theme across your assets will build trust and boost the visitor’s confidence. 6. Tell visitors what they are getting and how to get it using an action-oriented headline. E.g., “Download our free guide”. Clear, action-oriented headers are crucial to eliciting a response. 7. The landing page needs to promote the offer using a relevant image. Ideally, the image should depict the Offer (e.g., if it’s a consultation, include a picture of a consultant. If an e-book, include an image of the e-book). 8. Explain the Offer, its value and how it benefits the visitor in 3-10 sentences. Where possible, use bullet points, call-outs, plenty of white space, etc. to visually highlight your value/benefit statement. 9. The length of the form and the information requested needs to mirror the value of the Offer. Only ask for the information you need to get to the next phase of marketing, no more; long forms create friction, suppressing the response rate. 10. Make it easy for the visitor to find what he or she has come to the page looking for. Place all content as high up on the page as possible. If they need to scroll to find it, you may lose them. Wherever possible, chunk, or break apart the copy using numbers, bullets and bolding to make it easier to read and digest. 11. Remove all menu navigation and links from the landing page. Links distract the visitor, providing an avenue off the page. The page’s exclusive focus must be the Offer and its value. 12. Be sure to include a Thank You page. The last step of lead conversion, the Thank You Page turns the visitor into a lead by 1) delivering the Offer, 2) thanking the lead for submitting the form, 3) providing additional information and direction for what the lead should do next, 4) prominently including social sharing options - take advantage of their current good will! There are 5 crucial search engine optimization (SEO) elements on each web page: Page Title, URL, Page Header, Internal Links, and Page Content. All of these elements need to be optimized with keywords; ideally, the same keyword, which is the keyword the page is trying to rank for. 13. The Page Title is the description that appears in the browser’s page tab (in most cases you need to scroll over the tab to see the full title). 14. The URL, or Uniform Resource Locator, is the web address for your page. It appears in the browser’s address bar. The URL includes your web site’s main address and the address for the specific page you are on. 15. The Page Header is your page’s headline, or in HTML terms, the H1 tag. The purpose of any headline is to grab your reader’s attention and compel them to read what follows. Typically, best practice dictates one H1 tag with the keyword or theme you are trying to optimize, but there are exceptions for HTML 5 so long as keywords are used one per content section, not overused, and in context. 16. 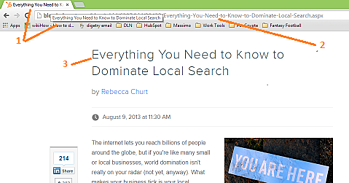 Internal Links are hyperlinks on your page that link to other pages on your own site. Ideally you want to use keywords as the actual text in the link. 17. The keyword should appear in your Page Content, ideally in the first 100-150 words of your page copy, but at least somewhere within the page’s content; any images on the page should include a keyword in the meta description. 18. It’s paramount that you optimize your social media profile. The page profile for whatever network you are on needs to reflect your company’s brand and messaging, explain who you are, what you do, and include a link to your website. Use consistent graphics and messaging across the different social media platforms you use. 19. Be sure to share relevant and appropriate content. Share industry content that is meaningful and valuable to your target audience. 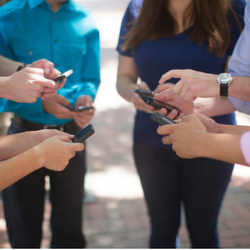 Each social media platform is different, so don’t use the identical content and messaging in multiple platforms. Tailor your content to the platform. Include images in your posts, and remember, it’s called ‘social’ media for a reason . . . be social! Share content and engage. 20. Publish on a consistent basis. How often you publish depends upon what network you are in; Twitter, at minimum, is several times a day. Facebook is about telling stories, so posts should be less frequent but well crafted: a couple time per week or once or twice a day, at most. While on LinkedIn, posting unique content daily is appropriate. 21. Include links in your tweets to drive traffic to landing page with a relevant Offer or piece of content. 22. 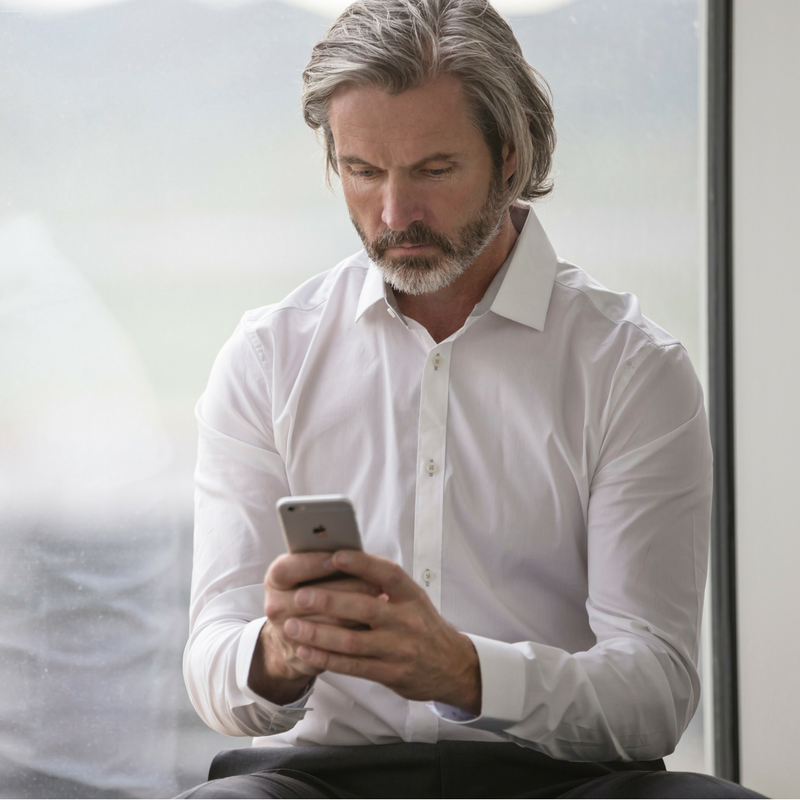 Ensure that your website is mobile friendly. The businesses that make the greatest amount of effort to service these people will be the ones getting the most visibility and the most new business. - Text too small to read? - Links too close together? - Content wider than screen? 23. Utilize marketing automation and tracking tools. Track and measure who is coming to your site, what sources they are coming from, what they are doing on your site (and not doing), optimize content for personalization, nurture leads, and re-market to website visitors. Marketing automation software allows your business to nurture leads and convert them into customers through personalized, behavior-triggered content. It automates tasks to improve efficiency and speed while measuring performance. Blogging and content marketing help attract new visitors and convert these visitors into leads and frequency is extremely important. Promote quality, useful, and relevant content to your target market by making use of your subject matter expertise: take existing content and make it available in chunks in the form of marketing. Create discrete Offers to generate interest, and don’t bury it deep within your site: use call-to-actions to drive traffic to discrete landing pages. Include the ability for visitors to easily share content on social platforms by placing social media sharing options on all your website pages. This establishes credibility (social proof) and increases leads. 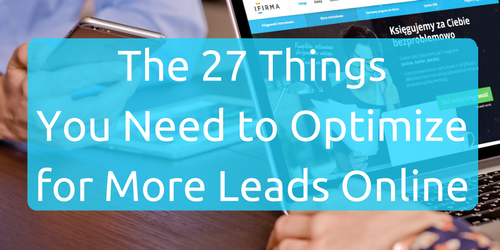 So there you have it, the 27 things you need to optimize in your online marketing in order to achieve consistent and predicable lead conversion. Once you have a lead, the next question becomes, What do you do with it? 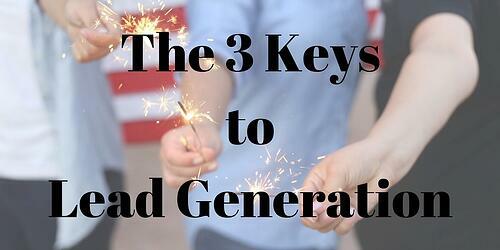 How do you convert leads, or prospects, into customers. We cover that in a separate blog post, and here are 10 helpful tips that you can use. This is digetry's blog where you will find all sorts of valuable marketing ideas and practical information about how you can generate more leads online. If you would like to receive updates as new blogs are posted, put your email in below.